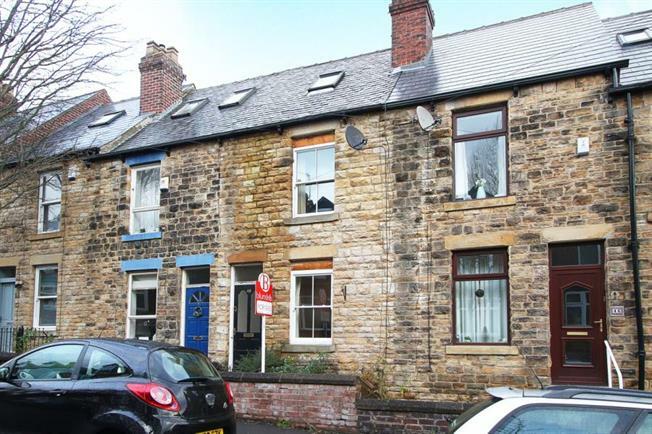 3 Bedroom Terraced House For Sale in Sheffield for Guide Price £200,000. An ideal opportunity has arisen to obtain a deceptively spacious three bedroom mid terraced property providing accommodation over four floors, being the ideal purchase for the first time buyer or investor alike having the benefit of being available to market with NO ONWARD CHAIN involved. With Gas central heating and majority double glazed this property is now ready for a new home owners personal touch as is in need of some modernisation. The accommodation is spread over four floors and in brief comprises: front facing lounge with an attractive cast iron feature fire surround and a door into the dining kitchen where a stairs case descends to the basement having a rear facing window and entrance door out into the rear yard as well as access to a further storage room. The kitchen has a range of wall and base units with integrated appliances to include gas hob, electric oven along with space and plumbing for a slim line dishwasher and the wall mounted gas heating boiler. Stairs rise from the kitchen to the first floor landing where a door accesses the front facing master bedroom and a further door leads to the bathroom having a three piece suite with mains shower and screen over the bath. From the first floor landing rise to attic bedrooms two and three. Externally: To the rear of the property is a yard area. Conveniently located in Ecclesall, a most sought after residential suburb on the south west fringe of Sheffield within easy access of the Peak District, Endcliffe Park, Sharrowvale and the excellent amenities of Ecclesall Road as well as being within the catchment for some of Sheffield's higher performing schools. An internal inspection is strongly recommended.